Swimming in water, whether it is at a pool, lake, or in the ocean, is one of the greatest activities you can do as a family. It is a great way to exercise, or alternatively, a fantastic way to relax. Humans are made of over 50% water, so when we are near an open body of water it centers us and makes us feel peace. If you are looking to go exploring through some water, like on a hike through the woods with a stream, you need proper footwear. There is nothing worse than having soaking wet shoes and socks on your feet during a hike. This is where water shoes come in handy. Water shoes are a great way to go through water, protecting your feet. They are very comfortable to wear and are going to protect you from unwanted bumps, bruises, or scrapes. We have compiled a list of the five best water shoes of 2018, complete with reviews and a comparison chart. One of the first things you are going to notice about the five water shoes we have chosen today is that they all come from different brands. We want to provide you with a wide spectrum of water shoes, with various features and pricing, that all come from different brands. All of the brands we have chosen are highly regarded and respected around the water world. 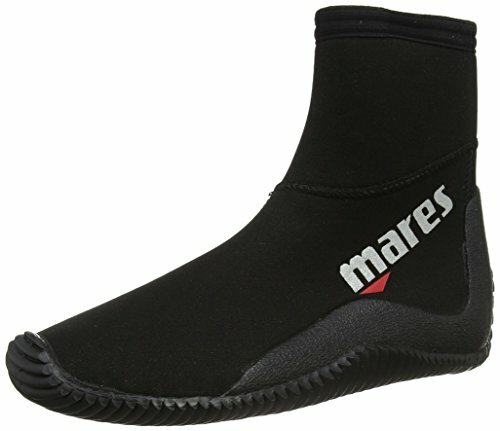 The first brand is the Mares Rubber Sole Classic 5mm Dive Boot. Mares has a proven track record of creating high quality water shoes at affordable prices. So how do these hold up when compared to the rest of our products? The Mares Rubber Sole Classic 5mm Dive Boot has been built with a zipper so you can easily take them off and on whenever you need to. This is crucial especially if you are on a hike and wanting to exchange boots at a brisk speed. These boots have been made with a sole that is durably built with a lot of traction. This prevents any tripping you may experience and you will not slip. These dive boots up the safety of your wading through water. The heel cap has been made with maximum durability to protect your foot from rocks or other harmful things at the bottom of water. There is a fin stop built onto the heel cap to keep the strap in place. It comes in black, and you can get it in sizes ranging from 4 to 13. What separates this shoe from others on this list is it comes with Mares’ fantastic full-manufacturer’s warranty. This is so important in case the shoes you get come with a defect or if they do not fit you properly. This is a must if you are ordering any product on line. One of the main things that I like about the Mares Rubber Sole Classic 5mm Dive Boot is that it is very easy to put on and take off. The zipper on it makes it simple to get it snug onto your foot. I also like how you can pair these shoes with Mares body suits for water so you can get a full outfit. They really do complement each other. These shoes have great traction, especially on slippery surfaces. I think the Mares Rubber Sole Classic 5mm Dive Boot could be a bit more comfortable, especially when walking in them for hours on end. As well, when you are in cold water they do not provide the warmth that you may need. There are other options on this list that are more comfortable and warmer, but they may not provide the efficiency that the Mares Rubber Sole Classic 5mm Dive Boot does. Next up on our Best Water Shoes of 2018 list are the Tilos 3mm Neoprene Fin Socks. Tilos is another brand that has strived to make high quality shoes at affordable prices. We understand that some of you reading this may be on a budget, and not looking to break the bank. If you are looking to save money, the Tilos brand may be for you. The Tilos 3mm Neoprene Fin Socks can be bought in one of six colors: gray, gray camo, black, black with aqua, black with blue, or pink. These are versatile water shoes and can be bought for both men and women. The neoprene material on them is 3 millimeters thick, which allows the feet to remain warm under colder temperatures. The nylon II neoprene material has been made with the highest quality, and is durable if under a lot of stress. The material is stretchy, so if your feet do go or expand (or shrink in colder water) they will adapt to the foot. The seams have been blind-stitched, allowing them to lay flat on the skin. This creates zero irritation of the seams and makes for a much more comfortable shoe. The silkscreen on the bottom is honeycomb and it allows for superb traction when on a hike or traveling through water. One of the best ways to use these water shoes is as a liner within your hiking boots. This will keep your socks dry should you go through dewy areas or a shallow river. These shoes are meant to be used more as socks so it is ideal to have them within another shoe or boot. The Tilos 3mm Neoprene Fin Socks are made out of fantastic material. I love how stretchy and comfortable they feel on my feet. I also am a big fan of the warmth when I am wearing these socks. They are a must if you are using your hiking boots a lot and keep getting wet. They will be a lifesaver. I also like the colors they come in. One of the worst parts about the Tilos 3mm Neoprene Fin Socks is that they are socks and not necessarily water shoes. While you can use them, they will not provide the maximum amount of safety when compared to other shoes on this list. Depending on what you will be doing in the water, you may need several pairs of water shoes that have strengths in various areas. 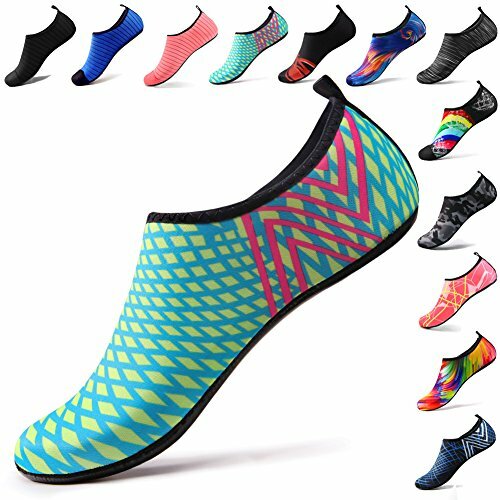 If you are a fan of snorkeling it is definitely in your best interest to purchase the Phantom Aquatics 3mm Surf Snorkeling Dive Boots. They are a great pair of diving boots. The Phantom Aquatics 3mm Surf Snorkeling Dive Boots are affordably priced and available in a variety of sizes ranging from 5 all the way up to 13. They have been made out of a nylon material, featuring 3mm wide neoprene. The material they are made out of is durable with a rubberized sole for maximum grip under strenuous circumstances. Phantom is a company that relies on fantastic sewing. The sewing job is unreal, with total strength and durability. There is a slip-on design, with a short top, that allows you to pull them on and off quickly. The neoprene has been designed to keep your feet warm at all times more so in warmer water conditions. They have been made to help you with agility and will be a great benefit if you are using them playing water sports. 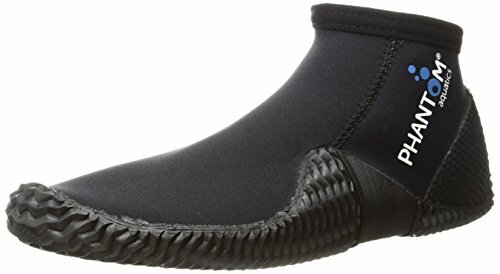 The Phantom Aquatics 3mm Surf Snorkeling Dive Boots are one of the most affordable pair on this list and I love that! You should never have to spend an arm and a leg on water shoes, especially if you aren’t using them that often. One of the best aspects of this shoes that I like is how warm they keep my feet for a long period of time. They are also great if you are playing games in a pool or lake such as water polo as they have great traction. I don’t necessarily like the style of the Phantom Aquatics 3mm Surf Snorkeling Dive Boots and there are not a lot of options to choose from. I feel that the material could be a bit higher quality and worry they will fall apart in a few years. Dreamcity creates shoes that feel like you’re walking on a cloud (hence the name “Dream”). They have a variety of options of real walking shoes paired with water shoes. So how do the water shoes hold up? The Dreamcity Men’s Water Shoes come in so many styles and colors with over 10 to choose from. Some of the colors include: grey, black, blue, black/white, dark grey, and light grey. There are numerous sizes available from 7 to 14. These shoes have been made 90% out of fabric material. The sole has been rubberized to provide extra traction. The top of the shoe features an air mesh system that is breathable, allowing the shoes to remain cool and the foot to breathe. This creates less odor. The midsole is made out of solyte which is lightweight and very durable. The outsole features Dreamcity’s Water grip traction that is superb when under water. The Dreamcity Men’s Water Shoes are the most comfortable on this list and I could wear them for hours, even walking on pavement and feel great. They are lightweight, breathable, and with so many great styles to choose from. They could be a bit warmer in cold water especially. I also which they slid off easier like some of our other options available on this list. The final pair of water shoes on our list are the STEELEMENT Water Shoes. They are very different than the four that came before and are also the MOST affordable pair on our list. If you are looking for the best price, look at these. The STEELEMENT Water Shoes have some of the best designs in the water shoe market. There are over 20 to choose from with various patterns and colors including: blue tie die, pink tie die, ocean aqua, dark black, and orange peach. They feature a neck design that is very smooth to prevent any chafing. They are lightweight, breathable, and can easily be placed as a liner inside of a hiking boot. I adore the style of these STEELEMENT Water Shoes. They are so great to look at especially when compared to the others on the list. They are super lightweight. The STEELEMENT Water Shoes could be made out of better material, especially on the outsole that does not offer as much traction as others. 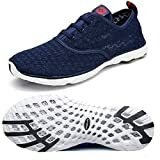 Now since you know our top 5 choices for the best water shoes of 2018, it is time for you to find what one is going to work the best for you. There are so many options to choose from that you need to know what to look for in a pair of water shoes. Below are the six things I look at before purchasing a pair of water shoes. There are various types of water shoes to choose from, and you can see from our list above that they are very different. The first type are more like insoles, and they usually are called water “socks” rather than shoes. These are extremely comfortable but are not meant to wear without a layer of protection over the top of them. The other type are actually shoes that you could even use walking through the woods. This is the most important aspect when picking out a pair of water shoes simply because without strong material you won’t have the protection you need. The first thing to look at is the stitching of the water shoe; are they stitched with top-notch precision? Are the shoes going to come apart after a year or so? Are they durable enough to endure hard rocks on the bottom of the water? Take a look at what they are made out of. Also determine if they are lightweight and breathable, in order to give your feet room to breathe. As with many types of shoes that you may be looking to purchase, the weight of water shoes is very important. You cannot get water shoes that are too heavy; the heavier the shoes are, the harder it is going to be to get to where you are going. Heaviness will amount to you feeling fatigued and if you want to feel better, find a pair of lightweight water shoes (the ones we chose are lightweight). Traction is so important when it comes to water shoes. The floor of the ocean is very slippery, and chances are you are going to walk on rocks, especially if going through a stream. It is crucial that the soles of the water shoes are built for traction and are rubberized to prevent an injury you do not want. The brand you are purchasing is also incredibly important. You should consider purchasing from a reliable brand, known for their dedication to delivering high-quality products. You want to purchase a pair of water shoes from a brand you can trust, and with exceptional customer service should anything go wrong. This is a fantastic question because you want to know what you are purchasing before you get them. Water shoes are a pair of shoes meant to be submerged in water. They allow you to go on hikes or wade through water while protecting your feet. Have you ever been in the ocean and cut your foot on a rock or on coral? It is not fun. Water shoes are meant to protect you from all of that. In our Buyer’s Guide above, we shared exactly what you should be looking for in a pair of water shoes. The main things to look for is strong material, comfort level, durability, and a fast drying time. You want a pair that is going to increase your safety, while also looking good on the outside. As with all shoes, your water shoes need to have a tight enough fit so that you fit snugly in them. Anything too loose or too tight is going to decrease your comfort level and you will not want to use them much. Find a pair that fits just right and remember that water shoes can shrink if in very cold water, so make sure you have a bit of wiggle room in them. This varies depending on the type or brand you have bought so always refer to what the manufacturer says about caring for your water shoes. For the average water shoe you can easily put them in the washing machine on an easy setting, with cold water (never hot). Other shoes are not meant for machines, so you can put them in the bathtub with warm water and a bit of soap and let them soak for a bit. If you are looking to make them smell better, stick some drying sheets in the shoes and leave them for a few hours. Water shoes have been built to dry easily. You can easily dry them by just leaving them out in the sun. If you need them dried right away, you can simply put them in the dryer on a very low heat setting for a bit of time. Always double check on the tag of your shoes that they can go in the dryer before putting them in. There you have it – the top 5 best water shoes of 2018. We hope that now you feel confident enough to go out and make a final purchase decision.